How much of a mandate does Legault of the Coalition Avenir Québec (CAQ) party really have? News media outlets have been clear since the Coalition Avenir Québec (CAQ) won Quebec’s provincial election: they won by a stunning majority. No, no, actually, they “romped to victory,” they won a “commanding majority,” they “surged,” “swept to power” and “stormed to a majority,” according to various sources. This rhetoric would make a person think the CAQ was elected by an overwhelming majority of Quebecers. Certainly, premier-designate François Legault would have you believe that. At a press conference held the day after the election, Legault proposed using the notwithstanding clause to force through legislation that would ban public authority figures from wearing religious symbols. He said the “vast majority” of Quebecers agreed with his proposed ban and, therefore, it wasn’t a big deal to use the clause (and besides, Premier Doug Ford already did it in Ontario). So, Legault wants to disregard a vital aspect of democratic society (the Constitution of Canada), but he cites a foundational democratic concept (that of “the majority”) as giving him the mandate to do so. It seems Legault is only interested in democracy when it suits him. Besides, a closer look at the election results deflates the idea that Legault represents the will of a majority of Quebecers. The CAQ received approximately 38 per cent of the popular vote. That in itself is not an “absolute” majority, which would require more than 50 per cent of the vote in order to have more votes than the combined opposition. However, in Canada, we operate by a plurality voting system, sometimes referred to as “first-past-the-post (FPTP),” where a party simply needs to get more votes than any other party to win. What this means is that a majority of the candidates who won seats for the CAQ did not get at least 50 per cent of the vote. Moreover, voter turnout for the 2018 election was estimated at 63 per cent. There are about six million eligible voters in Quebec; a little over 3.7 million of them came out to vote. This adds up to the CAQ representing 38 per cent of just 63 per cent of eligible voters, so approximately 1.4 million people. Legault speaks for 1.4 million people in a province of more than eight million. 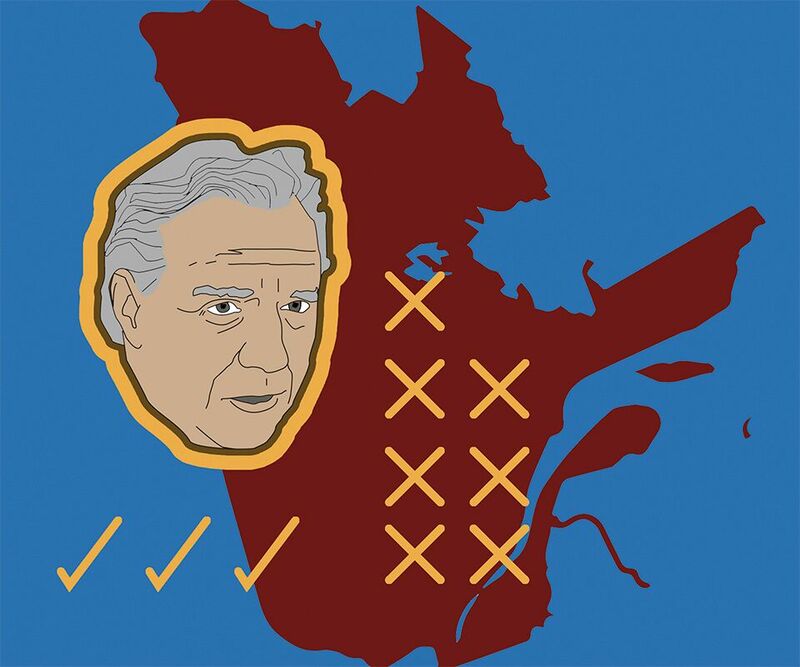 Legault’s majority is an electoral majority, and that’s a weak basis on which to claim one has a mandate to act for a ‘majority of quebecers.’ Pretty much anyone you ask right now agrees that the democratic election process needs reform. Elections keep resulting in situations where a small segment of voters can elect a “majority” government that doesn’t represent the true feelings of most people. An alternative model to FPTP is proportional representation, which essentially means the number of seats a party gets in the legislature is equivalent to the percentage of the popular vote they received. In Quebec, that would mean the CAQ had 47 seats in the National Assembly, the Liberal Party would have 30, Parti Quebecois 22 and Quebec Solidaire 19. In a situation like that, if the three opposition parties decided to put their differences aside and oppose the most egregious elements of the CAQ’s agenda, they could. That would be a truer representation of people’s will than the FPTP system. When contemporary conservative politicians are criticised for their inhuman policies, they often smugly reply that they have the will of the people behind them. We need to remind them of the basic facts of electoral democracy. Rarely does any government under a FPTP system have a real claim to majority representation. If you want us to accept your proposals, you need to argue them on the merits. So, tell me, what are the merits of state harassment of religious minorities?